Since 2008, we have raised over $110,000 for the fight against povery and hunger in Centre Wellingon. 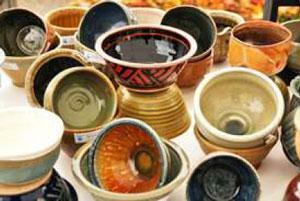 Empty Bowls and Empty Glasses will be available at the Sensational Soup-Off, Monday, October 8th from 1:00p.m. to 4:00p.m. at Aboyne Hall in the Wellington County Museum and Archives: 536 Wellington Rd. 18, between Elora and Fergus. A selection of the bowls are currently available for sale at Mermaid in Elora. These fabulous handcrafted Bowls and Glasses are available for the low price of $25.00. All proceeds go to battle hunger in our community. Empty Bowls events provide a means to raise both money and awareness about poverty and hunger in our communities. Volunteer local professional potters are the driving force behind these events, volunteering their time and energy to create soup bowls which are then exchanged for money in support of local charities. Bowls will be available at Styll gallery or at the Sensational Soup Off to be held on Thanksgiving Monday, October 12th, 2015, at Aboyne Hall. When you arrive at the Soup Off you will have an opportunity to choose a bowl from a fabulous selection of handcrafted bowls which have been set aside specifically for this event. The Sensational Soup Off promises to be a fabulous competition between professional and amateur chefs who will create memorable soups using local ingredients. Use your empty bowl to sample all of the soups and then cast your ballot for your favourites. At the end of the event, your bowl will be rinsed for you and your Empty Bowl is yours to take home. Staci Barron, Leah Blagden, Dorothy Collin, Murray Fox, Chris Hierlihy, Elsa Mann, Barbara Murphy, Tim Smith. Unique to Sensational Elora, the Elora Empty Glasses Project provided an opportunity for glass artists to give back to the community by creating glorious hand-blown and etched glass drinking vessels. The Empty Glasses Project has been cancelled but a small number of these glasses and goblets remain in inventory and will be available for purchase during Sensational Soup-Off. Only a very limited number of these unique glasses remain so make join us for Soup-Off to get your opportunity to buy one. 100% of the sale of these glasses and 100% of the sale of pottery soup bowls will be donated to local hunger-alleviating organizations like the Centre Wellington Food Bank and the Centre Wellington High School breakfast program. This fundraising project is a perfect fit for the Thanksgiving season. At a time when so many of us have an abundance of family, friends and food, there are those in our community who, at times, need a little help. The Empty Bowls & Empty Glasses Project is one opportunity to share what we have with others.